I have had a hard time getting motivated after Christmas. The beginning of the year is never a good time for me, I have a really hard time and don’t really feel like celebrating. This is a craft blog though! But I guess part of it may be that after all of the joy of the holidays, and stress and excitement, I just hit a valley, emotionally speaking. So even though I have lots of projects in mind for this year, its been hard to get started. Plus I got two new games for the Wii and that can always be a huge time sink and easy distraction. So to start the new year off nice and easy, I thought that I would start with a project that has been pushed off to the side for a long long time. The camera distorted the colors of the fabric in all these pictures, mostly because I was photographing at night. Its not so yellow. 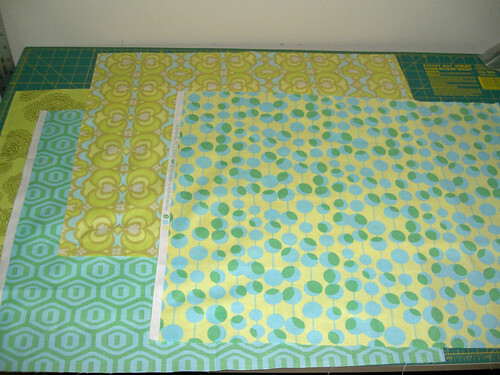 I bought this Amy Butler Midwest Modern fabric a long time ago to make a quilt for my bed. Unfortunately with all the babies being born and weddings I had to go to, and Christmas, and birthdays…it got sidetracked. So I decided to start the year with a project for myself. I finally started it, and now I am really excited to get it finished. Sometimes the hardest part is just starting. 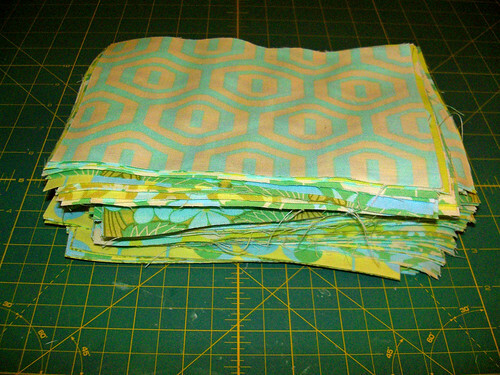 I bought fat quarters of all the Ohio Sky colorway fabrics in Midwest Modern. The blues and greens she uses are some of my favorite colors, very soothing and vintagey. The quilt itself is fairly simple, 198 4.5″ x 7.5″ blocks, sewn into 18 rows, which are then staggered to create the brick path look. 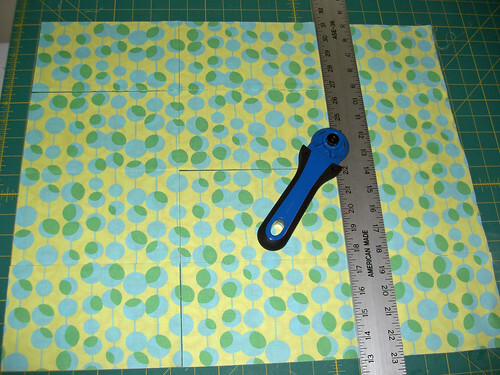 cutting was fast, nothing complicated here! It should come together fairly quickly, but I have had the hardest time finding matching pom poms that the pattern suggests sewing into the corners. I may leave them out. But I like pom poms, so I may try searching again or tea dying some white ones to match the creamy colors in the fabric. I think getting this done will motivate me for the other projects I have planned for this year. 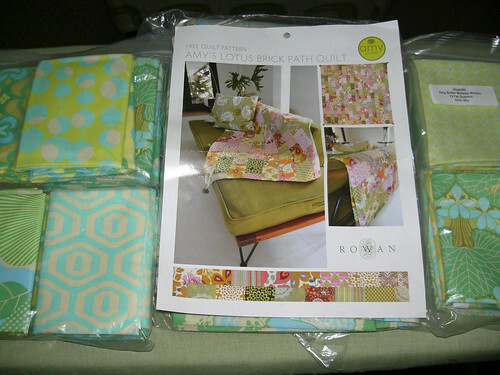 There are 2, maybe 3 more quilts I have sketched out designs for. This will be the first time trying something without a pattern. I ordered fabric from equilter.com for one of them which I can’t wait to show you once it arrives. They were having a huge clearance sale, so I picked up a lot of stuff. Besides my 2 quilt ideas, my goal is to complete about 4 baby quilts and a bunch of tie dye baby onesies and open up my first etsy shop this year. I am aiming for a may opening so I think that gives me plenty of time! There’s a lot to do before that happens, including learning how to take better pictures of my work, and hopefully getting one of my talented friends to help me design a logo and banner for my shop. I am really excited about doing this so I hope I follow through!